Radon is the leading cause of lung cancer among non-smokers. According to the EPA, it is responsible for over 21,000 deaths per year. That is a large number. 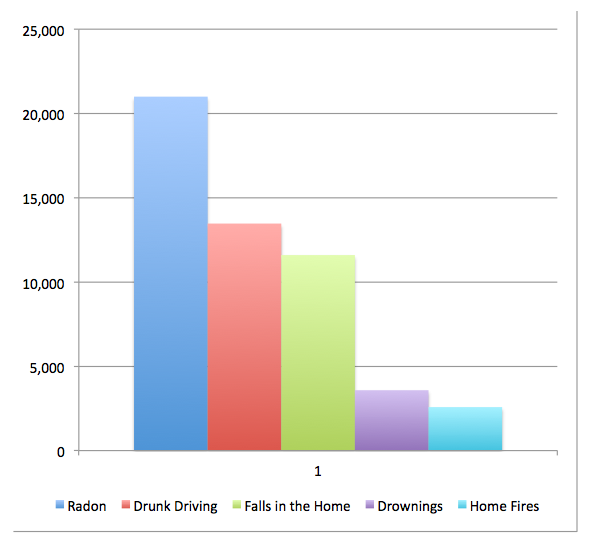 To help put it in perspective, we have a higher likelihood of dying from radon that we do from being killed by a drunk driver and a house fire combined. With such a high risk, testing your home is very important, and having a professional test performed can make all the difference. Contact us today to schedule your professional radon test. Radon a radioactive, odorless, colorless, tasteless gas which cannot be detected without a radon test, specifically. It is caused by uranium in soils decaying which creates the radioactive gas – Radon – that is attributed to causing over 21,000 deaths per year, according to the EPA. Because radon is naturally occuring, detecting it needs to be done using proper equipement, utilizing a certified lab. Your home is a trap for radon gas, allowing it to build up and preventing it from dissipating into the air naturally. Radon can enter through unsealed crawl spaces, cracks in floors and foundation, and the water supply. Radon in the air is a known cancer causing agent, and is easily tested for. Radon in your water is also known to cause stomach cancer as well. Radon levels at or above 4.0pCi/L are harmful in your home. The EPA recommends you begin with a short-term test and follow it with a second short-term test or a long-term test. The sooner you start your testing process, the sooner you can fix the problem if you have it.